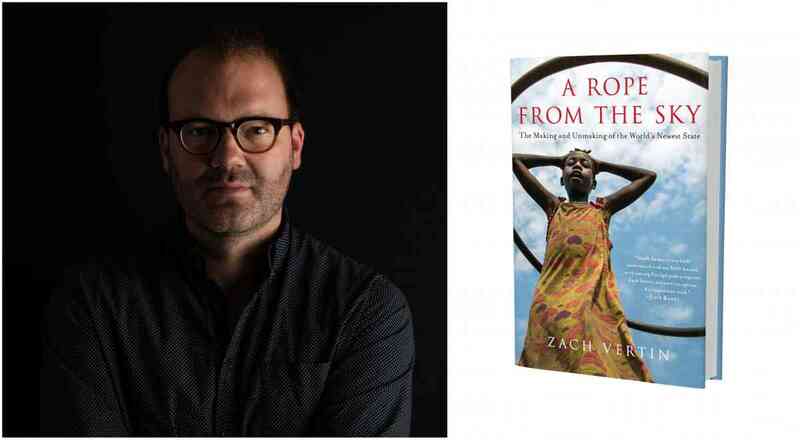 Zach Vertin reads from A Rope from the Sky: The Making and Unmaking of the World's Newest State. He will be joined in conversation by Stephen Franklin. A Q&A and signing will follow the reading. About the book: A remarkable chronicle of America’s attempt to forge a nation from scratch, from euphoric birth to heart-wrenching collapse. South Sudan’s historic independence was celebrated around the world—a triumph for global justice and a signal that one of the world’s most devastating wars was finally over. The new Republic’s birth was acclaimed not only by its long-oppressed people, but by three U.S. presidents and the legions of Americans who championed their cause. But the party would not last long; South Sudan’s freedom-fighters soon plunged their new nation back into chaos, shattering the promise of liberation and exposing the hubris of their American backers. Drawing on extraordinary personal stories of identity, liberation, and survival, A Rope from the Sky tells an epic story of paradise won and then lost. Zach Vertin’s firsthand accounts―from deadly war zones to the halls of Washington power―bring readers on an extraordinary journey into the rise and fall of the world’s newest state. South Sudan’s untold story is a unique episode in global history—an unprecedented experiment in international state-building, and a cautionary tale. A Rope from the Sky is propelled by characters both inspired and ordinary―their aspirations are matched by insecurities, their sins by courage and kindness. It is first a story of hope, power, greed, compassion, and conscience-shocking violence from the world’s most neglected patch of territory. But it is also a story about the best and worst of America―both its big-hearted ideals and its difficult reckoning with the limits of American power in a changing global landscape. About the Author: Zach Vertin is an American writer, foreign policy expert, and former diplomat; he has spent the last twelve years working in international peace and conflict issues. He is currently a Lecturer at Princeton University and a Fellow at the Brookings Institution’s Doha Center. He previously served in the Obama Administration as a Senior Adviser to the U.S. Special Envoy to Sudan and Sudan South Sudan, and prior to that he was a Senior Analyst for the International Crisis Group. He has written or commented for: The New York Times, The Washington Post, The Wall Street Journal, The Financial Times, Foreign Affairs, The Economist, The Atlantic, CNN, the BBC, and more. He lives in Washington, DC. About the Interlocutor: Stephen Franklin is a former foreign correspondent and labor writer for the Chicago Tribune. A Pulitzer Prize finalist, he has reported from Afghanistan to Peru. He has trained journalists in Egypt and Saudi Arabia, and created online courses for journalists around the globe for the International Center for Journalists. He is the author of Three Strikes: Labor's Heartland Losses and What They Mean for Working Americans.